A moist and juicy beef pot roast doesn't have to take all day. The Instant Pot shortens the cooking time dramatically without sacrificing flavor or texture. 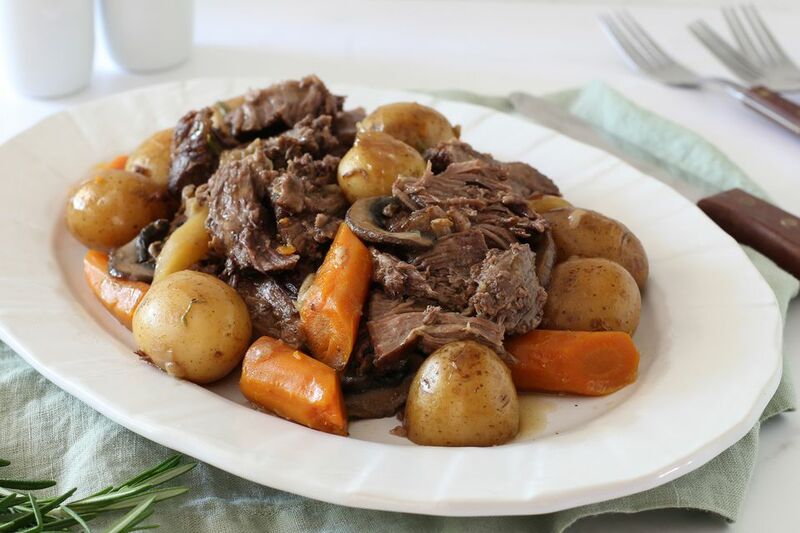 This pot roast with vegetables is melt-in-your-mouth tender after less than 90 minutes cooking time! Feel free to change the ingredients to suit your family's tastes. Add some frozen pearl onions to the pot if you like. For extra color, use a combination of multicolored baby potatoes, or use multicolored carrots. Rutabaga is another excellent option, or add a few parsnips along with the carrots. If you don't have fresh herbs, add about 1/2 to 1 teaspoon of dried crumbled rosemary or thyme, or use an herb blend. Season the chuck roast on all sides with kosher salt and freshly ground black pepper. Heat the oil in the Instant Pot on the sauté setting. Place the beef roast in the Pot and sear, turning to brown all sides. The browning should take a total of about 15 to 20 minutes. Meanwhile, peel and dice the onions. Rinse and slice the mushrooms, if using. Mince the garlic. Remove the roast from the pot and add the onions and mushrooms, if using. Sauté, stirring, until the onions are translucent. Add the garlic and cook for 1 minute longer. Add the wine, beef stock, Worcestershire sauce, bay leaf, and rosemary or thyme. Bring to a boil. Wash the potatoes and peel, if desired. Peel the carrots and slice into 1-inch lengths. Add the potatoes and carrots to the pot and top with the pot roast. Place the lid on the Instant Pot and set the vent to sealing. Select the manual setting and set the time for 60 minutes at high pressure. If the roast is very thick, add 10 minutes. If it is frozen, add 20 minutes. When the time is up, open the valve to release the pressure quickly. With a slotted spoon, remove the beef and vegetables to a platter and keep warm. If desired, strain the juices into a fat separator. Return the liquids to the pot and set it on the soup setting. In a small bowl, combine the cornstarch with the cold water; stir until smooth. Stir the cornstarch mixture into the simmering liquids. Continue to cook for about 2 minutes, stirring constantly. Drizzle about 1/4 cup of the sauce over the meat and vegetables. Pour the remaining sauce into a gravy boat for serving. Though the cooking time is 1 hour plus browning time, make sure you allow extra time—15 to 20 minutes—for the pot to reach full pressure. The quick release takes about 3 minutes.